Check out if Ceres is in The Top 100 NGOs 2013 Edition! Integrating sustainability into capital markets. Mobilizing $9.5 trillion in assets. Best Buy, Bank of America, Ford, Levi Strauss & Co., Nike, Starbucks and Timberland – these are just a handful of the companies initiating sustainable business practices with support from Ceres. Since 1989, the Boston-based organization has led a normative shift in corporate governance as it pertains to environmental issues like climate change, clean energy, water scarcity and supply chain sustainability. 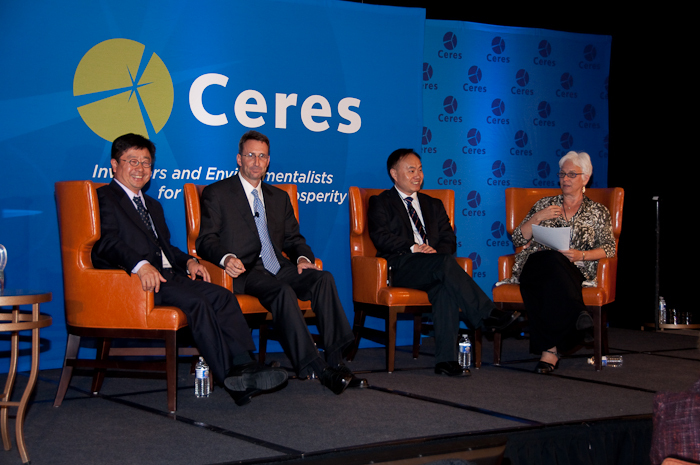 Uniquely situated at the nexus of the business, investment and advocacy communities, Ceres – which is comprised of a coalition of more than 130 institutions, public interest groups and investors – engages in a dialogue with leading companies and policymakers to influence critical decision-making. Alongside other initiatives, the organization also directs the ‘Investor Network on Climate Risk’, a network of nearly 100 leading investors collectively managing more than $9.5 trillion in assets, which mobilizes and leverages shareholder power to secure meaningful corporate commitments on sustainability challenges. Working in collaboration with – rather than in opposition to – the private sector, Ceres’ approach has achieved tangible, gamechanging results. Its ‘Global Reporting Initiative’ is now the de-facto international standard for corporate reporting on environmental, social and economic performance, while it has spurred important – and sustainable – environmental reforms in more than 80 companies.